516 ARTS is excited to team up with Found Sound Nation to co-present OneBeat ABQ, an international music event and art happening at the Albuquerque Rail Yards on November 1, 2014. This event is the culmination of a one-month residency tour from Saratoga, California to Albuquerque, which brings 25 musicians from 17 countries around the world (ages 19-35) to the U.S. to collaboratively compose, produce and perform original music and develop strategies for social engagement through music. Now in its third year, OneBeat is an adventurous new model of cultural diplomacy, which is an initiative of the U.S. Department of State’s Bureau of Educational and Cultural Affairs, administered by Bang on a Can’s Found Sound Nation. Hailing from Egypt to Venezuela, this year’s fellows include DJs and traditional instrumentalists, experimenters, indie-rockers and more. To name just a few, this cohort includes: Lara Klaus, a percussionist and educator from Recife, Brazil; Metin Kilic, a singer-songwriter and composer from Istanbul, Turkey; Peni Rini, an experimental vocalist from Java, Indonesia; Abdellah Hassak, a producer and organizer from Casablanca, Morocco; Dahlak Brathwaite, a Los Angeles-based MC and educator; and 20 other innovative musicians from an incredibly wide breadth of genres and backgrounds. For information about all the fellows, visit 1beat.org/about/fellows/#2014. OneBeat endeavors to be the nexus of a new way of thinking about how music can help collectively build healthy communities, prosperous societies and a more peaceful world. More than simply a music exchange, OneBeat is an incubator for music-based social entrepreneurship – a think tank for some of the world’s most promising artistic, technological and social innovators. The finale of their Western tour will be a unique, multimedia performance designed for the Albuquerque Rail Yards. It will include projects by local artists working with projection, technology and social engagement, co-curated by 516 ARTS, OneBeat and Albuquerque artist Billy Joe Miller. The theme of this year’s OneBeat is the Audible Invisible, finding sonic expressions for the invisible powers that control us, from gravity to electromagnetism to culture. The Rail Yards show on November 1 – wedged between Halloween and Dia de Los Muertos – will explore concepts of Spirit, one of the great invisible human universals. While the OneBeat musicians come from radically different backgrounds and religious beliefs (or lack thereof), they are all fascinated with the journey of spirit and particularly the notions of “thresholds” which spirits cross in life, death and other transformations. Interwoven with this musical performances will be art and video installations along these same themes. You are the Doorway is an art installation in the Railyard’s Blacksmith Shop that explores spirit, thresholds and the invisible powers that guide us. Visitors are welcomed to interact with a series of art installations across the enormous space. Utilizing painted surfaces, highly crafted objects, knitting looms, natural materials, video and performance, the artists have reflected on their journeys, questioned transofmative powers, and made sensitive, powerful, and often participatory pieces in response. They invite guests to step from spectator to participant and consider their own positioning in the dialogue. Featured visual artists include Michelle Montjoy, Ellen Babcock, Cedra Wood, Adam Wohlwend, Lance Ryan McGoldrick, Augustine Romero, William Feeney and Corvas Brinkerhoff. Video work by Karen Hipscher, Jackson Glasgow, Temujin Doran and UNM ARTS Lab. Performance art by Edie Tsong. 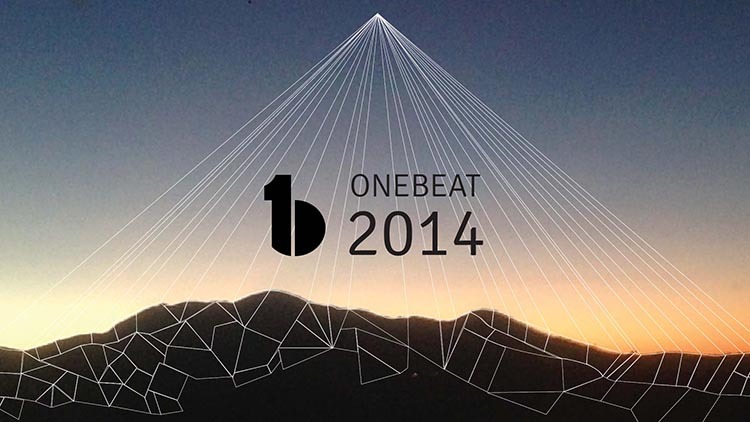 Save the date and don’t miss OneBeat ABQ!